Indeed. Those are the words of Jan Swenson, Executive Director of the Badlands Conservation Alliance, in one of her many letters to the U.S. Forest Service. The Elkhorn Ranch in the North Dakota Bad Lands is a tiny remote spot in one of North America’s most remote landscapes, a land of wide skies and sweeping vistas. It has escaped development and remained in its natural state for the entire 125 years since Theodore Roosevelt lived and ranched here. I know, I know, I have written about it several times, but the threats to the ranch continue unabated, and it is such an important place because, as we need to continually remind ourselves, it has been called “the Cradle of Conservation” in the United States. It is the home ranch of President Theodore Roosevelt, where he lived and ranched in the 1880s. It is where, in the solitude of this wild place, he developed his conservation ethic, and it was from there he went on to become our nation’s greatest conservation president. He said many times that he would never have become President if it were not for his time on his ranch in the North Dakota Bad Lands. On one of his return trips to New York, after spending time on his ranch in Dakota, he met with noted naturalist George Bird Grinnell and together the two of them, in the fall of 1887, founded the Boone and Crockett Club, an organization of sportsmen concerned that we might someday lose our hunting privileges and the wildlife populations for future generations. The Club’s Fair Chase statement was the cornerstone of the establishment of hunting seasons, bag limits, and the abolishment of market hunting practices. Club members helped to create the Lacey Act prohibiting the interstate shipment of illegally taken game. Club members helped to establish the federal duck stamp program. The National Forest Service, the National Park Service, and National Wildlife Refuge systems exist today in large part because of the extensive efforts of the Club and its members. Club members helped establish the Pittman-Robertson Act, which dedicated the monies from an excise tax on the sale of firearms and ammunition to go toward wildlife and habitat conservation. The Club has also been responsible for the support and continued success of numerous conservation programs and projects across North America. 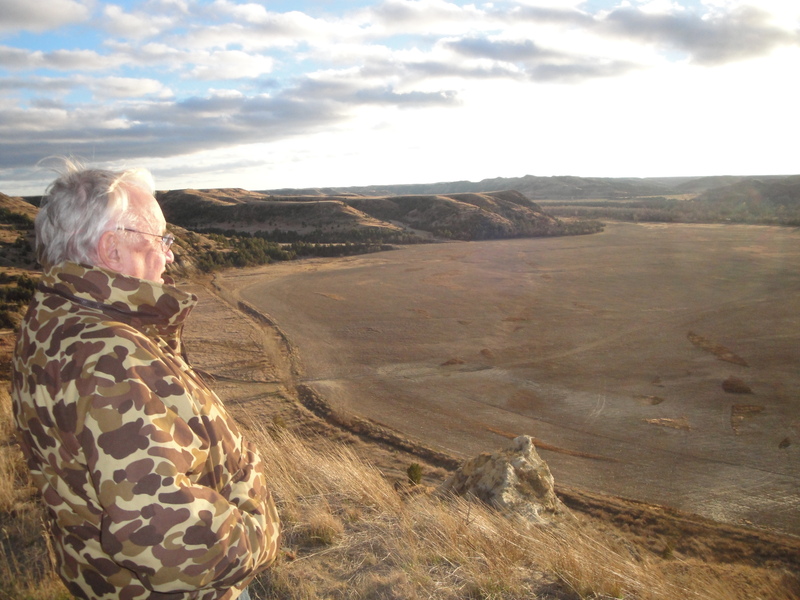 One such conservation effort was the acquisition of the Elkhorn Ranchlands, a 5,000 acre ranch directly across the Little Missouri River from the National Park Service’s Elkhorn Ranch site. Led by Boone and Crockett’s Lowell Baier, more than two dozen private conservation groups raised the funds to purchase the former Eberts Ranch, as Jan Swenson pointed out above, and donate it to the U.S. Forest Service, hoping it would one day become a prairie preserve and buffer against development for the Elkhorn Ranch site. That goal is so close. But the threat of a gravel mine less than a mile from Roosevelt’s cabin site could be just days away from becoming a reality. Because of that, more conservation groups have joined the battle to protect Roosevelt’s ranch, and there are new developments on that front almost daily as well. A private mineral owner named Roger Lothspeich is ready to build the road to the 25 acres already permitted for gravel extraction. Meetings are scheduled between Lothspeich’s engineers and the Forest Service to hammer out details of the access road. Then construction can start. Once the road is built, gravel mining can begin, as early as next spring. Last January, the Forest Service completed a required Environmental Assessment of the project, found “no significant impact” from the gravel mining operation, and issued a mining permit. But the road needed to be built first, and that hasn’t happened. So mining has not begun. Meanwhile, the National Parks Conservation Association, at the end of September, filed a federal lawsuit against the Forest Service, alleging that the Environmental Assessment was incomplete. So the project is in the hands of a judge, and that judge could decide that the mining should not start until the case is settled, which could take a year. That’s what the conservation group and its allies, including the Boone and Crockett Club, are hoping. But the Boone and Crockett Club is not known for sitting around for a year and waiting for things to happen. These boys like action. So they are working with the National Trust for Historic Preservation and members of the Roosevelt family to make the place a National Monument, with the protections National Monument status would bring to the ranch. There are two ways a National Monument can be created. First is designation by Congress. To that end, the two groups are meeting with our Congressional Delegation, asking them to introduce the legislation required to grant National Monument status to the ranch. We’re waiting now to hear the outcome of those meetings and the delegation’s reaction. Certainly, if you’d like to help, a phone call, e-mail or letter to Senators Heitkamp and Hoeven and Congressman Cramer would be helpful. They need to know the project has support back home. The second way a National Monument can be created is through the use of the 1906 Antiquities Act, created, ironically, by President Theodore Roosevelt. Under that act, the President can, all by himself, create a National Monument. Indeed, Roosevelt himself created 18 National Monuments, including the Grand Canyon and Devils Tower, in the two years remaining in his term after the Act took effect. Many presidents have used it since. Almost 130 National Monuments have been designated by 15 presidents over the years. Most recently, President Jimmy Carter designated 15, President Bill Clinton designated 19, President George W. Bush designated 6 and President Barack Obama 17 (so far). Since the passage of the Antiquities Act, Presidents Richard Nixon, Ronald Reagan, and George H.W. Bush are the only Presidents who have not created National Monuments. National Monument status for the Elkhorn Ranchlands would likely be accompanied by either an appropriation to purchase the privately owned surface minerals—gravel and scoria–stopping the gravel mine from happening, or negotiations to swap the minerals for minerals of equal value somewhere else, away from the Elkhorn. But it would bring additional long-term benefits. Hunters, hikers, photographers, birders and others who enjoy the outdoors and the Badlands would gain access to undisturbed areas for seasonal enjoyment. All of those activities can be allowed, and even encouraged, in a National Monument. Cattle grazing could continue. And, the peace and quiet of the “Cradle of Conservation” across the river would remain uninterrupted for visitors to that nearly-sacred site. Tweed Roosevelt stands on the hilltop overlooking the Elkhorn Ranch, once the home of his great grandfather. I visited the Elkhorn Ranch a week ago with Tweed Roosevelt, great-grandson of President Theodore Roosevelt. We forded the Little Missouri River in my trusty Jeep and drove up the steep hill to the gravel mine site on a two-track trail. We stood where surely TR once stood, probably many times, overlooking the ranch site across the river. That two-track trail, I pointed out, is about to become a road big and wide enough for huge gravel trucks to haul away the hillside in a cacophony of dust, grinding gears and jake-brakes. “We’ve got to stop that from happening,” he said, and he left for home two days later with a renewed commitment to work with North Dakotans, other Roosevelt family members, and the conservation organizations seeking national monument status. North Dakota always seems to be at war with the federal government and its agencies. And “big, out-of-state conservation organizations” seem to be bogeymen, for their efforts to help our state preserve its land and its legacy. Here’s a case where partnerships with federal agencies, and support for those conservation organizations, can bring huge benefits to the people of our state. For that I say Good Luck, God Bless, and God Speed, to the National Trust for Historic Preservation, the National Parks Conservation Association, and the Boone and Crockett Club. Previous postA Collaborative Approach To Regulating The Oil Industry. Yeah, Right. Good information. I’ve long wanted to make Elkhorn part of the South unit, but am told that is impossible. National monument status is vital to the site’s preservation. I’m all for it and will email Heidi and Hoeven. Please explain a little more about the gravel mining at Elkhorn Ranch. Previously you wrote that 35 different names are on the mineral title plus the Eberts. Why don’t they have to sign a lease or agreement to allow mining? Oil leases need to be signed by all owners. It they don’t they become part owners of the well and are responsible for expenses, etc. Why can one owner speak for all the others? Well, I’m no lawyer, but from what I have been told, any mineral owner can go get the minerals and keep his or her share of the profits.I’ve asked the Forest Service to explain to me who is going to keep the books and make sure the other mineral owners get their share, to no avail. I’m not sure even they know how it is going to work. Lothspeich owns about a fourth of the minerals. He’ll pay to get the gravel out, I suppose, do the bookwork, and pay everyone else off out of the profits. Again, the Forest Service has not explained that process to me, so I’m only speculating. I guess we’ll cross that bridge when we come to it. If mining ever starts.